Harrison County is one mile north of Stratton House Inn. Stratton House is only three miles from New Athens, which is referenced below. Because of its proximity, the history of Harrison County is as much a part of Stratton House as is the history of Belmont County, in which it is located. The following individuals lived in Harrison County and had connections to New Athens and Cadiz. They all played a significant role during the Civil War, and were closely associeted with Abraham Lincoln, in life and in death. 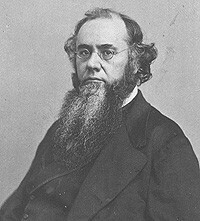 Born in nearby Steubenville, Edwin M. Stanton served as Harrison County Prosecutor, practiced law in Cadiz, and taught law at Franklin College in New Athens. Stanton later served as United States Attorney General and was best known for his service as President Lincoln�s Secretary of War during the Civil War. He later was appointed to the United States Supreme Court, but died before he could serve on the bench. Bishop Mathew Simpson served as President Lincoln�s spiritual advisor. A bishop in the Methodist Church, he gave the funeral oration at President Lincoln�s entombment in Springfield, Illinois. Bishop Simpson, a Harrison County native, is reported to have strongly influenced President Lincoln�s decision to issue the Emancipation Proclamation. A graduate of Franklin College in New Athens, John A. Bingham was an attorney and Congressman who served as one of the prosecutors of Lincoln�s assassins. Congressman Bingham was author of the due process clause of the 14th Amendment and served as Floor Manager in the House of Representatives for the legislation which gave rise to the Fourteenth Amendment to the United States Constitution. Harrison County resident General Thomas Vincent served as a coordinator of the recruitment efforts of the Union Army during the Civil War. General Vincent attended to President Lincoln on his deathbed. Custer Birthplace, which covers George Armstrong Custer and Thomas Ward Custer. Both were born in Harrison County, and both played heroic roles during the Civil War. Thomas was the only soldier to receive the Congressional Medal of Honor twice during the Civil War. Both later would die in Montana at the Battle of Little Bighorn.